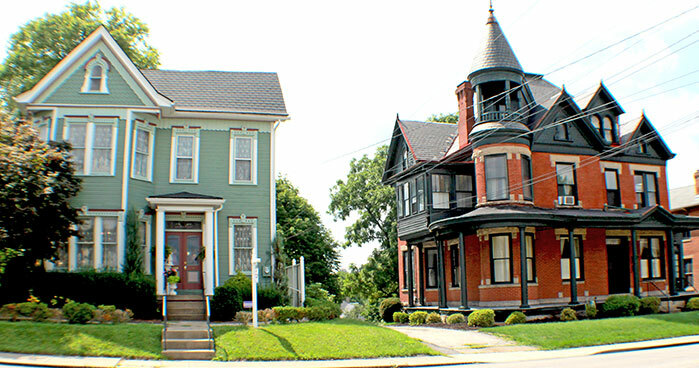 Each Greensburg neighborhood has its own distinct character. The residential neighborhoods contain primarily larger, older homes that often feature unique architectural detail and a construction quality that equals or exceeds that of most new developments. Families and older individuals represent the core population in the residential neighborhoods, while younger professionals and college students often choose to live downtown. Academy Hill is located north of downtown Greensburg and is one of Greensburg’s most identifiable neighborhoods. The Academy Hill Neighborhood Association plans several seasonal public events, such as the Backyard & Garden Tour in the spring and the Ghost Tour at Halloween. This collection of 250 homes is rich in significant and historic architecture, which led to Academy Hill’s designation as a Historic District in 1999. Saybrook Village is a newer residential neighborhood offering a variety of living styles. A short drive from downtown, residents can choose from split-entry homes, condominium units, townhomes, and apartments. Saybrook Village is near the golf course at Hannastown Golf Club. The Underwood and Hilltop neighborhoods share picturesque views of downtown Greensburg. The illuminated Courthouse Dome and church steeples add to the impressive natural skyline. Only a five minute drive from the big-box retail stores on the US Route 30 corridor, residents of these neighborhoods can also walk to Nature’s Way for natural foods and Little E’s Pizzeria for specialty pizzas, including gluten-free and vegan options. Four-square, 2-story houses are the dominant style here, with a mix of Craftsman and Cape Cod style homes completing the neighborhood. The Shuey Plan is a 1930s-1940s era neighborhood that boasts a view of Seton Hill University’s fabulous tree-lined campus. Homes in this neighborhood are desirable due to their close proximity to US Route 66 and Route 130. Lot sizes tend to be larger in the Shuey Plan than in other City neighborhoods. Northmont is a tree-filled neighborhood located near Greensburg Salem High School and Nicely Elementary School. The neighborhood was developed in the 1950s and is perfect for someone looking for a particularly tranquil City neighborhood. Greensburg’s newest neighborhood is Park Lane; developed in 2005. Located on the west side of Route 130 and just below Seton Hill University, the 20-acre neighborhood won the 2006 Smart Growth Award for new residential development within Westmoreland County. Residential opportunities in Greensburg’s downtown include apartments above retail establishments, apartment buildings, condos, lofts and some larger homes. In Greensburg, living downtown does not mean sacrificing charm for convenience – many downtown apartments and homes contain hardwood floors, original staircases, and other historic features. Downtown Greensburg also offers modern industrial style residential lofts.